Portraits in UV: Thomas Leveritt video of faces in ultraviolet. 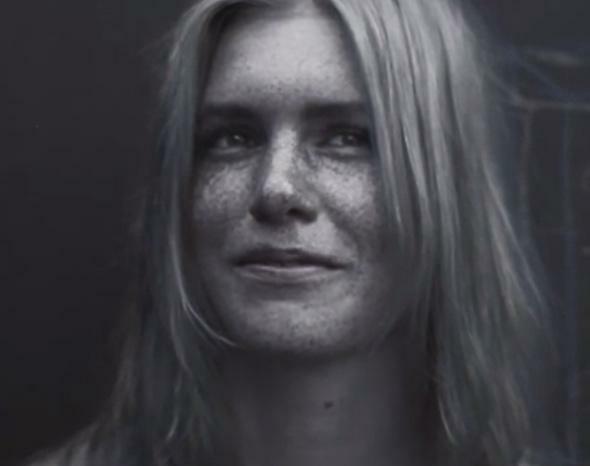 In the ultraviolet, you see what people look like under—and inside—their skin. I spend a lot of time thinking about how narrowly we see the Universe. Our eyes perceive the narrowest slice of the electromagnetic spectrum, the huge range of flavor lights comes in. Radio waves, infrared, ultraviolet, X-rays, gamma rays—they make visible light, from blue to red, seem hopelessly parochial. You don’t need to go far outside what the eye can detect to learn a lot about the world around you. Photographer Thomas Leveritt knew this and decided to find out for himself what he could see. The genius part here was giving people sunscreen. The camera detects UV from the Sun that’s reflected off people’s skin; the point of sunscreen is to absorb that UV so it doesn’t even reach the skin. Since no UV is reflected from sunscreen, it appears black in the video, even though in visible light it looks white. It looks like people are smearing crude oil on their faces, which is pretty funny. Ultraviolet is slightly higher energy than the bluest light we can see. It comes in three varieties: UVA, UVB, and UVC. These go from longest wavelength (lowest energy) to shortest (highest energy). The Sun emits far more UVA than UVB, and not a lot of UVC. That’s good: UVC has enough energy to kill cells. What little the Sun emits is mostly absorbed by the Earth’s air and the ozone layer (which is why we launch space telescopes like Hubble into orbit; they get above Earth’s irritatingly UV-opaque air and can see the higher energy light coming from objects in the Universe). UVB is absorbed by ozone as well, but some gets through. Some small amounts are beneficial, triggering vitamin D production in the skin. If you get too much, though, it causes sunburn, destroys vitamin A in the skin, and causes cancer. UVA is less dangerous than UVB but still not great. Long-term exposure can indirectly lead to cancer (creating chemical compounds that are carcinogenic) and destroys collagens in the skin that “age” it. I contacted Leveritt, and he informed me that he used an AstroDon UVenus filter and a camera with a CMOS detector. Looking that information over, I think he was detecting light around a wavelength of 330–380 nanometers, smack dab in the UVA range. When viewed in the UV to the infrared, the Universe is a lot more interesting. 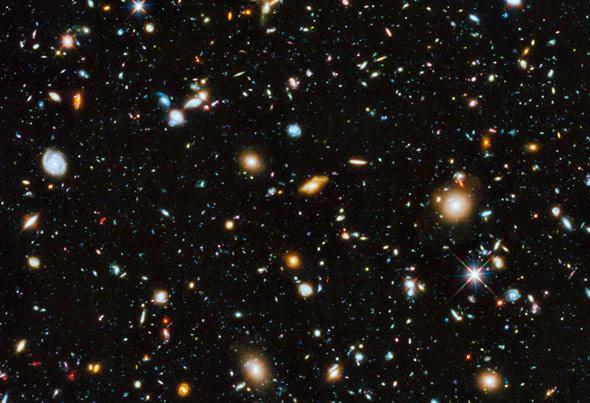 This Hubble shot shows galaxies in all their glory. Click to encosmosenate. It’s fascinating to see how skin looks different there. Melanin, a pigment in the skin, absorbs ultraviolet light much more than visible, so in the video patches of melanin—freckles!—look very dark. Glass blocks UV light quite well, especially in modern eyeglasses which are coated with a layer specifically designed to protect our eyes from solar UV. In the video it’s obvious that works. Interestingly, some people’s teeth are very reflective in UV, and others’ weren’t. Plaque, resins in fillings or crowns, food, and enamel all absorb different amounts and colors of UV, probably accounting for those differences, too. Leveritt is a gifted portrait photographer, and I’m glad he’s getting some attention for this. I suspect manufacturers of sunscreen will be lining up to talk to him once they see this video. Tip o’ the sunscreen tube cap to Jennifer Ouellette.